Homesteading Today - Backyard Farming in Today's World. Homesteading Today - Find tons of information and tips on creating your own backyard farm whether you live in the city, 'burbs or country. 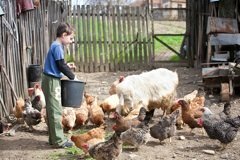 Homesteading - Adopting a self sufficient lifestyle that includes a variety of sustainable backyard farming techniques. A little or a lot depends upon your location, how much land is at your disposal and municipal ordinances. The more land you live on the more self sufficient your homesteading life can become but many of our suggested techniques take very little space. It's surprising what can be accomplished in a thoughtfully set up suburban yard. Urban homesteading offers lots of options for city dwellers to create their own backyard farm and live more gently on the land. Small scale sustainable homemaking, agriculture and livestock raising can be achieved by urbanites who feel the country calling. Most homesteaders begin with something like organic gardening and composting. The hand in hand connection between composting organic waste and cycling it back into an organic garden will not be lost on those who are living consciously. Canning and preserving the harvested bounty just seems like a natural progression from growing it. It's amazing how simple and satisfying it is to "put up" food that you grew in your own yard, creating a clean cycle where chemicals and preservatives have no place. Harvesting rainwater for your backyard farming projects takes you another step closer to self sufficiency and takes a load off the water bill too. Keeping critters affords a number of opportunities for producing other foods. Backyard chickens can supply your family with organic eggs. It doesn't take much space and most city by-laws allow for 3 to 5 hens (no rooster). Rabbits are another food animal that take little space, reproduce remarkably fast and are allowed in most city ordinances. Bees are quiet and take only a small space. In addition to producing wax, propolis and one of the finest foods in existence (honey), they perform a valuable service by pollinating fruit trees and plants, making sure that orchards and gardens produce an abundant crop. A goat or two can provide milk, cheese and meat in a small amount of space and the family milk cow is making a comeback on acreages, producing an abundance of fresh milk that can be used as milk, cream, yogurt, butter and even cheese. You don't have to do everything yourself either. If your neighbor is raising bees and you have hens, both of you may have an overabundance of harvested food from time to time. Arranging to trade your excess eggs for the neighbors excess honey is a win win. Bartering with like-minded neighbors can also expand on the types of foods you have on your plate that were produced within 100 miles of where you are. The 100 mile diet is a recognized method of decreasing the impact of your footprint. Ideally everything on your menu will be produced within a 100 mile radius of your home keeping the need for transporting to a minimum. Used clothing can find a new and fulfilling life as quilts and re-created clothing or salvaged building materials can be repurposed into fabulous creations. You'll be amazed at what you can do, with what you have. Homesteading your home is all about living simpler, wiser and healthier lives through a strong connection to the environment. Visitors to our Homesteading Today page may also be interested in the following pages.